Changes in climate can be caused by changes in Earth’s atmosphere, as well as changes happening in other Earth’s systems. Oceans and glaciers are examples of such systems. Nowadays, human activity also has considerable effects on the climate change. These causes originate within the Earth itself and are, therefore, known as internal causes. Among external causes of the climate change are changes of solar radiation or changes of Earth’s rotational orbit. Changes in the amount of heat stored in the world ocean. See our previous post for more information about non-anthropogenic factors. Anthropogenic factors include all types of human activity influencing the environment and the climate change. It is still difficult to say how much the climate change depends on the anthropogenic and non-anthropogenic factor. One of the hypotheses by Australian and Swedish researchers suggests that humanity’s influence on the climate is 170 greater than nature’s own influence. Within the past 7000 years, Earth’s climate has also been changing. These changes have, however, been gradual. The situation has drastically changed within the last 100 years. 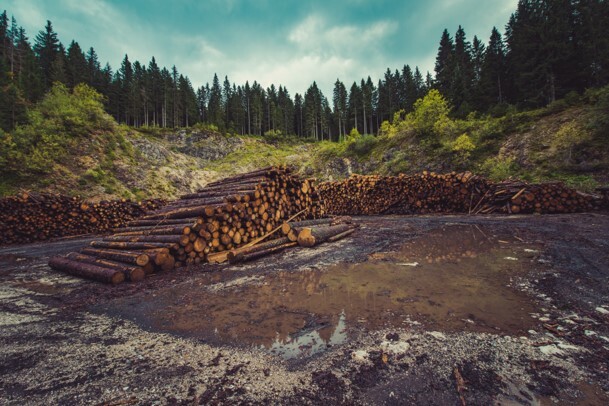 The term “deforestation” describes any process resulting in transformation of land occupied by forests to land not occupied by forests, for example, farms, cities, roads, etc. Deforestation can be cause by natural events, like hurricanes, parasites, lightening-induced fires. Anthropogenic factor is, however, the main cause of deforestation. Forests are mainly cut down for agricultural purposes – to create farm fields, plantations or grazing grounds. Most forest fires are also caused by humans. Deforestation results in decrease in biodiversity, diminishing wood reserves, in soil erosion, decrease of water levels in rivers. Moreover, deforestation greatly enhances the greenhouse effect. Carbon dioxide stored in the forest masses gets released to the atmosphere when these forests are being cut down. About half of the existing forests have been cut down within the last 8000 years. Of the remaining forests only 22% represent natural ecosystems, the rest have been significantly altered by humans. Burning fossil fuels also leads to CO2 emission to the atmosphere. CO2 is a greenhouse gas that remains in the atmosphere for centuries, significantly contributing to global warming. Climate studies have reliably established a close to linear relationship between the magnitude of global warming and the amount of CO2 accumulated in the atmosphere. Contrary to what many people think, controlling climate change is not necessary in order to take care of nature or the environment. Controlling climate change is taking care of the survival of humanity. If the climate changes too much, our species will not be able to survive on this planet. Nature, on the other hand, will always find a way, like it had many times before.